The Avila Beach Community Foundation is a charitable organization created to accept donations and fund projects for the enhancement and betterment of the Avila Beach Community, in perpetuity. Involve the members of the Avila Beach community in the process of completing projects to improve the community, thereby uniting the residents and visitors to achieve common goals. Minor Grants: Projects usually requiring funding of less than $5000. Major Grants: Projects or programs seeking funding of $5,000-plus. Sponsored Grants: The Foundation would provide a matching allocation for this type of project and co-sponsor the project for funding by an external entity. 1. Improvements in the physical, cultural, and social well-being of residents and visitors of the Avila Beach Community. 2. Enhancements beyond the services normally provided by government and private agencies. 3. 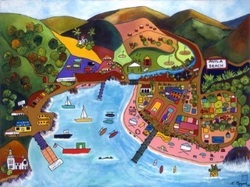 Projects that reflect the history and culture of Avila Beach residents and visitors. 4. Projects that provide for permanent improvements.